Before the Romans arrived in this area there was an Iron Age settlement called Durwhern and also a tribe called Cantiaci. The Romans renamed the town as Cantiacorum Durovernum. Once the Romans left and Kent was invaded by Germanic warriors from the North Sea and Denmark, the town was renamed as Cantwarabyrig which means "the bury of the Kentish people." 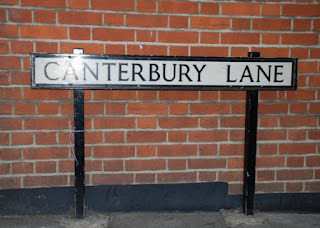 Now a days, young people refer to Canterbury as "Canters".